Let Them All Eat Cake!! I am an office worker. I wake up at 5:00am and schlep myself via train, across three cities to the big, booming metropolis of Toronto. Truthfully, I have no idea, other than the fact that I really have no desire to live in Toronto. It’s a lot of people crammed into a small space, with a lot of buildings, and they have possibly the craziest mayor EVER (if Jon Stewart takes the time to talk about you, you gots to be all kinds of crazy). Burlington is nice…lot’s of green space, fresh air, I live not far from the lake…but I digress. One of the hardest things about working in an office, whether it’s a 1.5-hour commute or right in your own backyard, is the amount of food that passes through the doors every day. Lunch meetings, staff appreciation events, staff birthdays…our meeting rooms are a never-ending revolving door of food. But it doesn’t end there. Leftovers make their way into the kitchen and it’s a constant battle to not snack. Cookies, donuts, cake, sandwiches…how’s a girl suppose to deal with all of this? 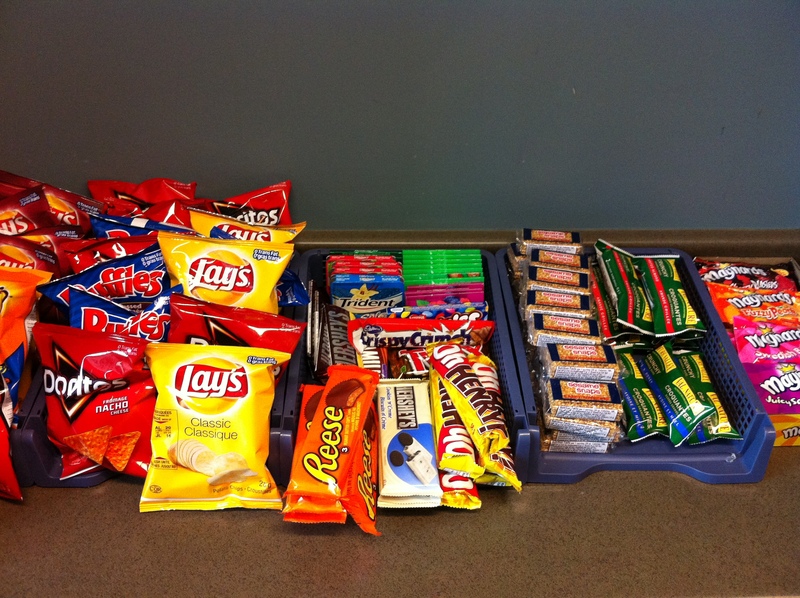 This is the snack food counter in the kitchen. All proceeds go to the social committee, so eat up! Chips, chocolate, candy, gum, and my personal favourite sesame snaps. I can’t go into the kitchen to get a glass of water without being confronted by this area of extreme deliciousness. It’s a constant struggle and it is exhausting. Especially if I’m having a particularly stressful day. I’ve tried to find ways to not have to deal with all the delicious, yummy, not-so-good-for-me food; I bring my own snacks to work and keep them in my desk drawer, I have a large water bottle that I fill up in the morning so I don’t have to make as many trips to kitchen, and I try not to get involved in too many lunch meetings. Everything was going pretty well, until Cake Day on Thursday. Stupid Cake Day!! Once a month, the staff gather for cake to celebrate everyone who has had a birthday in that particular month. Fortunately, I didn’t have the opportunity to participate in Thursday’s Cake Day because I was on a conference call. I ate my regular snack (almonds and raisins) and everything was going as planned. Later in the afternoon I went into the kitchen to fill my water bottle, and as soon as I walked into the kitchen I knew it was there. I could feel its presence…CAKE! I opened the refrigerator, and there on the second shelf was a plate of…CAKE! Not just any cake…chocolate cake. My arch nemesis. Sitting there, looking all smug. And there is nothing worse than a smug cake. I couldn’t help myself, I was lost beyond all reason! So, I ate the cake. Just one piece. And it was sooooo good (not so smug now, are you my icing-laden friend). So even the best laid plans get turned on their ear—even if just once a month for Cake Day. Back to almonds and raisins for me. Tune in next week, when Victoria battles it out with a self-righteous Cinnabon at the train station. My office is the exact same way!! So many offices are like this karyssac! It’s no wonder people have such a hard time maintaining a healthy lifestyle. Well done you! Ha ha!